Just when I thought the fashion industry’s obsession with African-inspired wax prints was just for a season or two, Moschino Cheap & Chic designed stunning looks for their Spring 2013 collection at London Fashion Week. Maybe Moschino’s creative director, Rossella Jardini and Cheap And Chic’s designer, Francesca Rubino is just as obsessed with African batik prints as we are all? I do however love the tropical, pineapple prints! Much of this collection I can definitely see on who I call – the industry’s prints ambassador fashionista Solange Knowles. 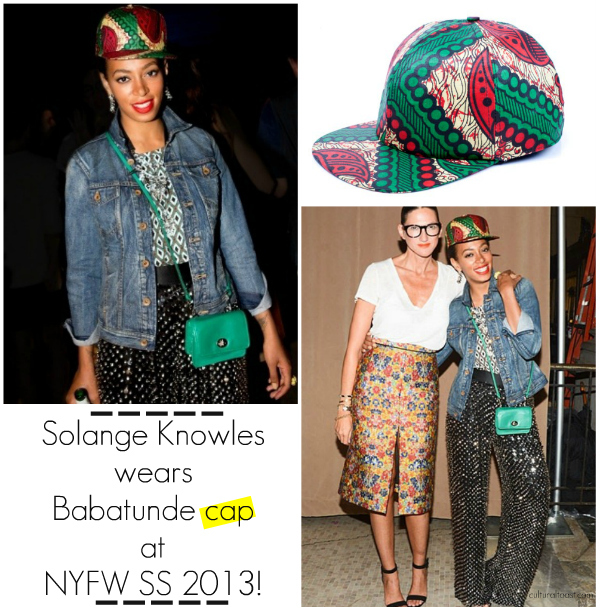 Speaking of Miss Knowles, she was spotted at New York Fashion Week rocking a wax print hat by South African fashion label Babatunde. Thoughts on Moschino Cheap & Chic African-Inspired runway look? 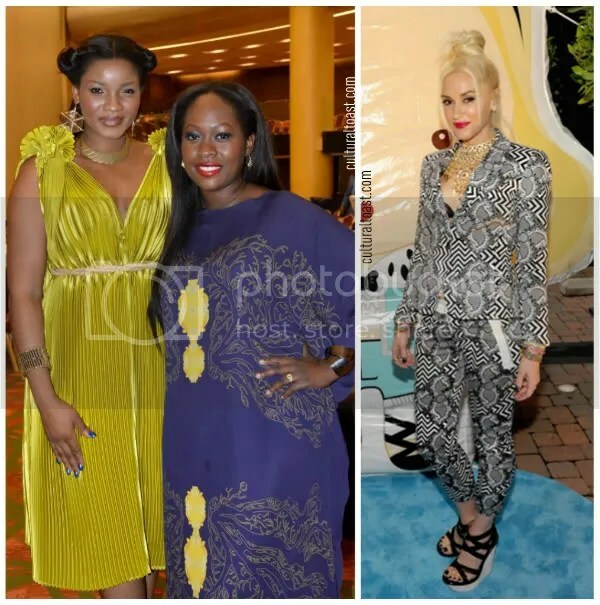 Two of the global’s biggest stars – Omotola and Gwen Stefani – put their own funky spin on cultural red carpet style. Gwen opted for the African fashion fabric prints while Omotola channeled a classic, Grecian-inspired look. 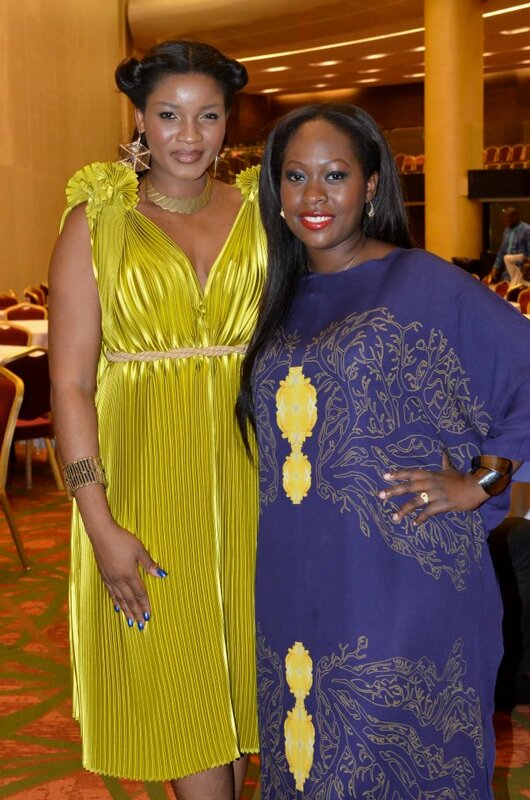 Nollywood superstar Omotola was seen in a yummy yellow Bunmi Koko low-cut pleated creation alongside the dress’s creative director Bunmi Olaye. 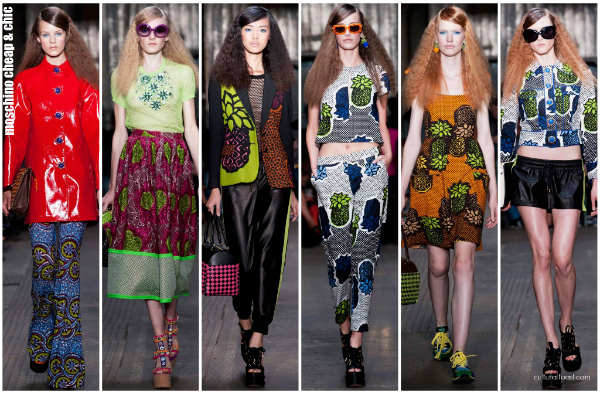 Bunmi Koko as CulturalToast.com first reported just wrapped up their appearance at New York Fashion Week to fave praise! 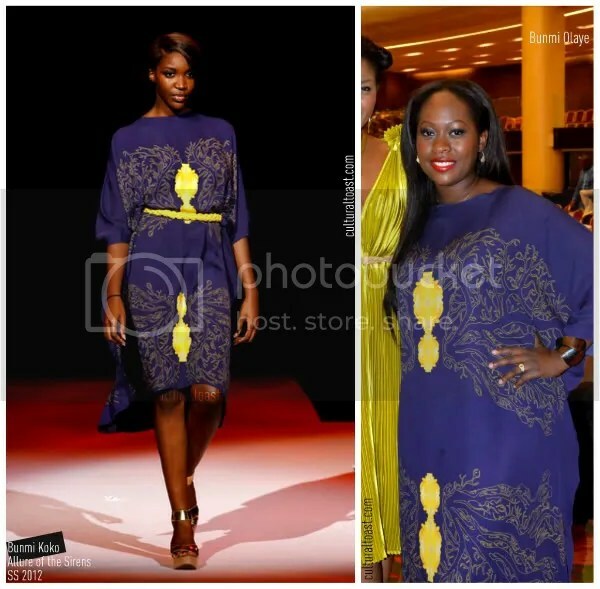 For those that recognize Bunmi’s lavender and yellow caftan, it made its runway debut via her Allure of the Sirens presentation at this past NYFW! 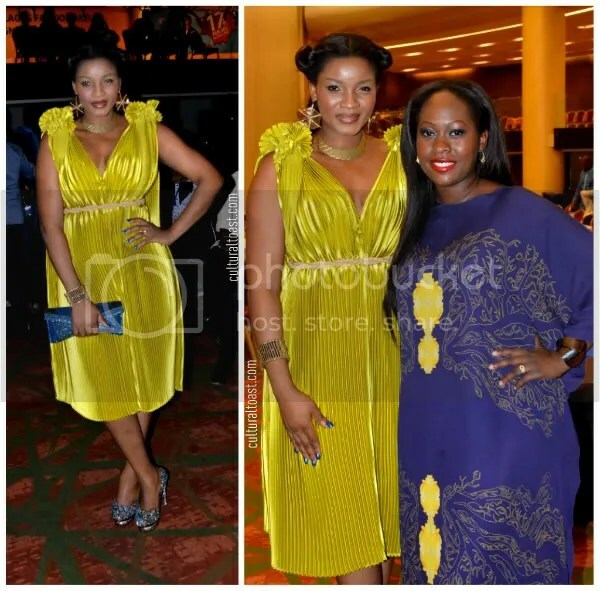 It’s always great to see Nollywood embracing the African fashion scene! 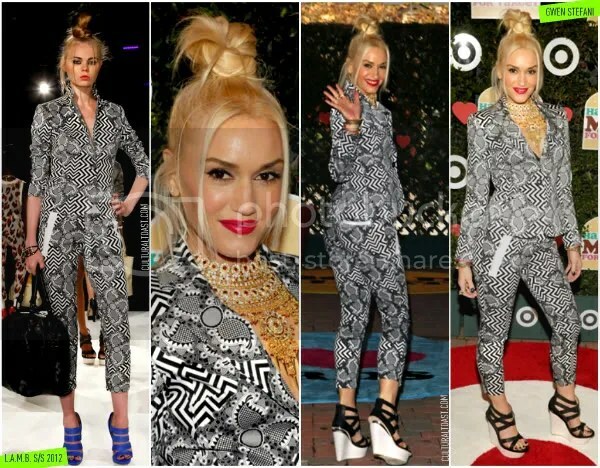 Gwen Stefani wears a black and white batik-inspired pantsuit from her L.A.M.B Spring/Summer 2012 collection at the launch of her new Target children line, Harajuku Mini. 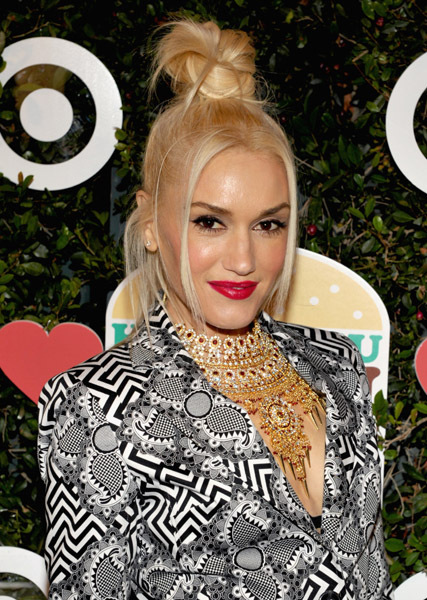 It’s no secret that Gwen loves prints. Her past two collections was heavily influenced by African fashion fabrics from ankara to batik. We love that Gwen kept the same hair and the outfit as the runway look.